I love Yankee Candles, which means I have a plenty of semi-empty old candle jars. I saw this DIY on Pinterest awhile back and knew it would be the perfect way to clean the jars. This was such an easy project – but I still didn’t know what to do with the jars – until I remembered that I have been looking for a new way to store my makeup. My bathroom has a funny little alcove that usually rotates my nail polish, cotton balls and candles. My makeup usually gets moved around in travel makeup cases, but I really wanted a place to store and enjoy my makeup. This is the makeup organization I came up with! For cleaning the jars, I used this tutorial. The boiling hot water did its magic and the hardened wax rose to the surface of the jars. It took a little arm work with an SOS steel wool pad to clean the jars fully, but it worked so easily. When I was done, I had two sparkling clean jars! I cleaned my bathroom shelf, and filled one jar with face makeup, one with eye makeup, and one with brushes. 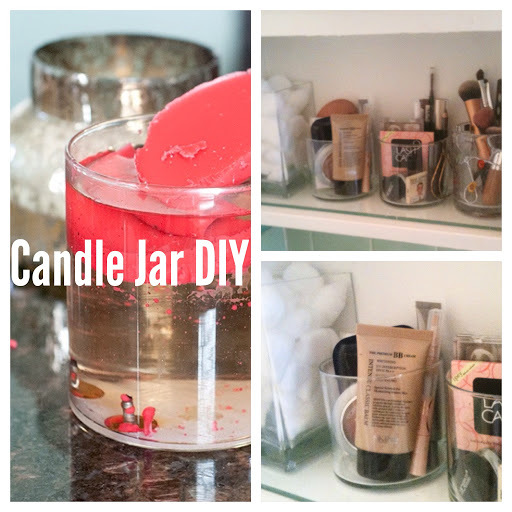 (The 3rd jar with the brushes isn’t part of the DIY – it’s a kitchen glass waiting to be replaced). You can tell, I don’t have a lot of makeup but at least now it is pretty and accessible! I love seeing this when I walk in my bathroom now. Maybe one day I will actually share my makeup favorites with you :).